Whether you’ve inherited a ton of photo albums from your parents, or you’re having a hard time handling your own photo collection – here are streamlined instructions for getting organized! Of course, if you happen to be overwhelmed at any point during the process, contact us for a consultation on how we can help you finish organizing your media! If you’re like the average person, you probably have photos scattered all over (iPad, iPhone, Albums, Shoeboxes, Computer, SD Cards). I recommend buying 2 External Hard Drives specifically targeted to organizing your collection. These external hard drives are duplicates (one is a backup in case something happens to the other). From here, you can start dragging and dropping all of your media onto 1 External Hard Drive. What does this look like? Basically, you can sort your folders by year-who-what where. Create one master folder on your external hard drive, and then list the years chronologically as you see down below in the picture (2014, 2015, 2016). Then within each year, create folders for each month starting with January (2015-01) and so forth. From there, drag and drop the photos into the appropriate folders. Here is an example of what a Core Folder Structure looks like. We all have various duplicates. 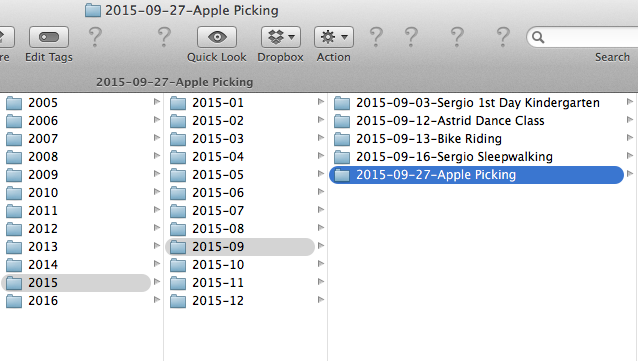 By having your photos organized chronologically, it makes it much easier to weave out duplicates. Deleting duplicates non-software based can take GOBS of time. To make it easier and more efficient, buy a low cost software to save you time. If you’re on a Mac, try PhotoSweeper for $9.99. 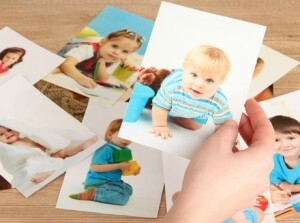 If you’re PC based, try Awesome Duplicate Photo Finder (free). As with any software, you will need to invest time in learning how to use them properly. We all know the familiar default photo names like ‘IMG_7832’ or ‘DCM_0542’. But when you’re trying to find a certain photo from a particular date, it can cause a challenge! 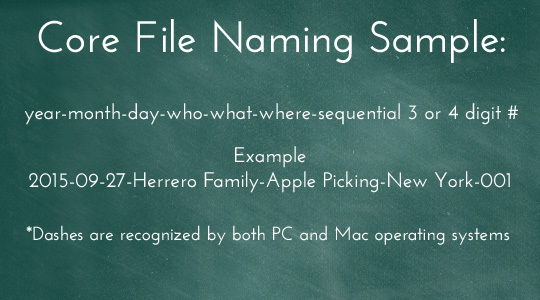 Even if your photos are divided in to named folders, files can accidentally be switched from folder to folder. This leads to the photo organizers greatest secret: the file naming system of the who-what-where. You can use a variety of programs, such as Adobe Lightroom, Photo Mechanic, Forever.com, Mylio.com to organize Meta-Data. Each program has its Pros and Cons so do your research. These programs can be quite confusing and robust, so make sure you practice on a small batch before doing heaps of organizing. There are so many options (Dropbox, Google Photos, Flickr, Amazon)! Whatever you choose, remember to have your photos also backed up to at least 2 external hard drives (as suggested above). After doing much research, I actually use a combination of the following for my own family archives: Forever and Mylio. Forever is permanent, cloud based storage. This site is great for people who prefer something simple. They might only have 1 computer and just want to view and share their photos with loved ones, while backing them up. Store your “best of the best” photos here, which you’ll want to show for generations to come. Visit our blog post here, which talks more in depth about Forever. Mylio resides locally on your desktop and other linked devices. Mylio is for those photo enthusiasts which have multiple computers, phones and cameras. In case someone steals your labtop, all your photos can still be retained on your other labtops or devices. It’s a great organizational toolkit for creating a photo structure, file names, keywords and metadata. Not to mention deleting those unwanted blurry photos. I use Mylio to sort my own photos, keyword. Then my top album photos are transferred to my Forever Account. I suggest you have a monthly maintenance program in which you designate the 1st week of every month your “photo cleanup week”. Granted, we all get busy with this so that’s what I’m here for! For those of you needing a monthly maintenance program with our photo organization packages, contact us here on getting started!